Modern-Day Salvation Encounters, brings together forty true stories of highly dramatic, incredibly astonishing, and riveting Salvation conversion encounters. These personal and highly intriguing first-hand accounts, are experienced by persons from widely diverse backgrounds. Some of the story contributors include a Nobel Peace Prize Nominee, Olympic and Paralympic Medalists, Hollywood actresses, script writers, and stunt persons, a legendary song writer who wrote a hit song for Tina Turner entitled ‘I Can’t Stand the Rain’, a CIA/INTERPOL agent who was miraculously rescued from death by an angel, and a man who fled Iraq after crashing a car gifted to his father by Saddam Hussein. Other story contributors include founders of successful corporations, ministry and business leaders, a university founder, authors, inventors, scientists, and motivational speakers. Several contributors have experienced face-to-face encounters with the Lord, and one contributor even was given a personal tour of Heaven after he died, and before he came back to life again to share his incredible story. All of these wonderful story contributors have come together though for one purpose–to share their compelling, and uniquely personal Salvation Encounter with you. Of particular note of interest, all of these story contributors who have chosen to freely share these amazingly true, real-life stories, have also agreed to include, their first and last names, along with the city, state, and country in which they reside. Many contributors have also included their contact information. 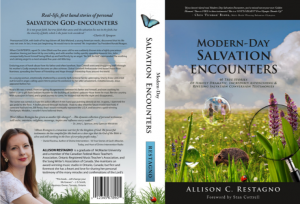 Modern-Day Salvation Encounters, by Allison Restagno, is being carried world-wide by most major bookstore chains. Thank you for taking the time to view this Modern-Day Salvation Encounters website. It is my great hope and prayer that in reading Modern-Day Salvation Encounters, that you will experience your own very special Salvation encounter with the Lord! I pray that this book will serve to be a wonderfully encouraging, and uplifting read in Jesus!